India is known all over the world as one of the countries that house the best software or technology talent. Interestingly, there are many hosting providers in India, but none of them is of Indian origin. Most of the top players are from USA, Canada and Europe. This is when we set out to bring about a change in the hosting industry with Hosting Raja becoming the very first, 100% Indian Hosting company. Today, Hosting Raja is one of the leading hosting companies that has been trusted by over 150000 customers across 150 cities in India. Our Award winning support and constant focus on innovation have led us to this position today. Our parent company where Hosting Raja was initially incubated was a web development company working on Drupal, Joomla, WordPress, Magento projects. It was then that we realised the true pain points of dealing with hosting providers who offer inadequate support in our local languages and during our working hours. With that vision in mind, we ventured out to build a full-fledged hosting company that is dedicated to serving the needs of Indian customers and meet their expectations in the best way possible. Currently, we have served over 1,50,000 happy customers and counting. Our solutions provide an array of standard shared hosting plans along with custom designed plans that can cater to any level of software, website or application development projects. We additionally give VPS, cloud and dedicated servers too. Our hosting service is not only affordable but also one of the most reliable in the market. In fact, we pride ourselves in being called an outstanding, first-rate, reliable and affordable web hosting company in India. We aim to be an extended arm to our customer’s technology needs as far a web hosting is concerned. We do not hesitate to go the extra mile while enhancing and upgrading our service levels and technology in such a way that it helps meet the customer’s goals. Hosting Raja is the trustworthy partner for small organisations that work on tight budgets. Our aim is that our customer must get the best Web hosting at an affordable price and have a hassle free experience while making their business successful. At Hosting Raja we lay utmost importance to the support we offer for our customers. The Teams of support engineers are well equipped to resolve the customer concerns by getting to the bottom of the problem and solving it to satisfaction. Our uptime is 99.9% which is extremely good as per industry standards. Our support numbers can be accessed 24/7 /365 days, and we also offer multi lingual support. So customers feel comfortable explaining the challenges they face in their mother tongue and our support team members get to the action quickly. We offer phone, chat and email support 24/7. We offer numerous plans of web hosting packages to serve all types of the bloggers and web developers, whether they are a small enterprise, mid-sized corporations or big organisation. We provide FREE .in or .com domain on a purchase of our premium hosting plans. Migrating hosting can be challenging and frustrating. @ Hosting Raja we offer this service for free with no downtime in the process. Hosting Raj has been consistently chosen as a TOP CUSTOMER CHOICE when it comes to migrating servers to our ecosystem. One of our most attractive features is reduced latency as our servers are the best and fastest. We’ve created a wide variety of top web hosting applications using both Windows and Linux web hosting, which is primarily based systems that constitute to the specified infrastructure and technical expertise. An optimised control panel for better speed on your servers. Varnish Cache to accelerate your web application and improve the speed. FREE website optimisation for improves sales. Cache optimisation for better static delivery. We provide all types of VPS like KVM, Hyper-V, VMware based etc. SSL Certificate – FREE Life time. Get SSL certificate for your website free as long as you renew VPS hosting with us. Cpanel and Plesk control options are available. When you choose our VPS Hosting, we also migrate your data from another provider to our servers. Our Windows and Linux VPS hosting plans are the most competitive in the market. For the millions of small businesses in India who wish to exploit the online medium with the help of their website; a company like Hosting Raja that understands the price sensitivity of an average SME comes as a boon to accommodate their shoestring budgets. We provide different types of web hosting like Windows, Linux, WordPress hosting, Magento Hosting, unlimited hosting etc. We also provide free .in or .com domains on select packages. Cloud hosting is based on the most innovative Cloud computing technologies that allow an unlimited number of machines to act as one system. The load is balanced, security is taken care of, and hardware resources are available virtually so they can be used when needed. The cluster of servers is the cloud. When it comes to Cloud hosting- HostingRaja is one of the top companies to provide secure, fully managed, scalable cloud hosting at an affordable price. Pain-free cloud migration of your web application to our servers. The Cloud platform is designed to provide high availability of bandwidth, firewall, switches and computer. Auto Spam email protection and Auto SSL module integration. Varnish cache for better and faster performance of your website. Fully managed cloud hosting solutions. Your cloud is handled by top cloud experts in India. Multi Php Version integrated with Inbuilt Secure File Upload modules. MySql Query optimisation, MySql cache optimisation. We also provide one of the best in class support for our customers. At HostingRaja we provide fully managed, performance-tuned dedicated Servers, for our customers at an affordable price. Web-Optimized Virtual Machines with MySQL-Optimized Virtual Machines which is Powered by Linux-VServer. Unlimited Domain Hosting, with Root SSH Access and Storage & Bandwidth. We have IPv6 Support with Canned CGI Scripts. Full Unix Shell, and lot more features. Backup and restores service too. Varnish Cache server to speed up your website. Multiple PHP and MySql Version this is available only when you buy VPS servers from us. Aliases – Alias for mailbox and Apache spam assassin. Here are some of the main technical and cPanel features provided by HostingRaja. UNLIMITED Domains – You can host unlimited websites in certain hosting plans. Secured servers with 6 phase security. Backup & Restore Your Website – Regular Backup & Restore of a website. Domain Name Checker – Find the right domain name for your website. We provide SSL hosting, and all your website can be secured with our secure hosting. HostingRaja also provides Hotlink Protection to protect your website linking from another website. Our flagship product Hosting Raja Cloud office is a one stop destination for all tools a startup or a small business owner would need, to kick start their digital journey in the most cost effective and hassle free way possible. As an entrepreneur, your first and foremost requirement is to create a professional image of your business while presenting to your prospective customers. Without a professional domain name or an email id, it’s difficult to establish a trust building image of your business. 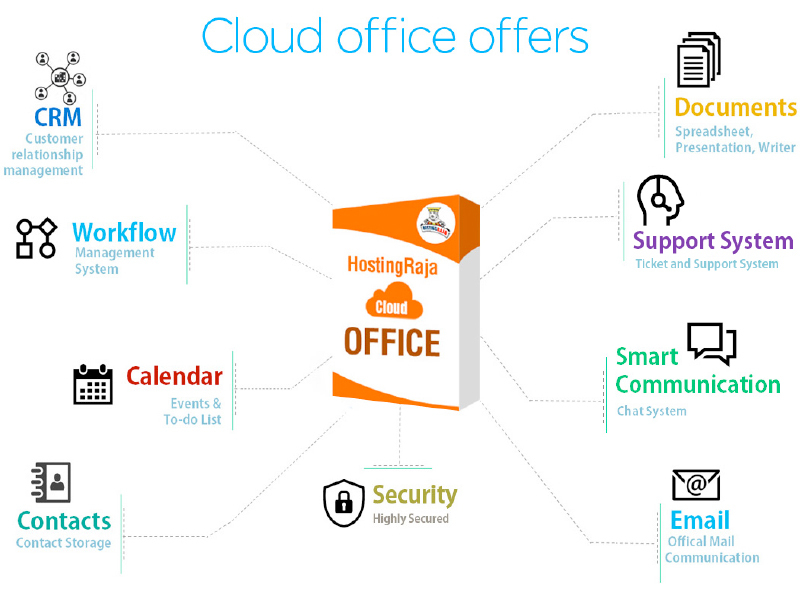 With the Hosting Raja Cloud office, you not only get email ids for your business but also get a plethora of other features that are rolled together to simplify your business needs. Next articleIs eBay’s Affiliate Program Worthwhile or Is It Risky? I am a Senior Citizen Architect by profession.I am interested in affilliate marketing.Can you help me with my web site hosting? Great, After reading all plans and best services I am decided to use Hosting raja Hosting services for my website.